Like a secret hiding right under our noses, neutrinos fly through our bodies by the billions every second, carrying with them—physicists hope—clues to the biggest riddle of all: Why are we here? With no electric charge and the tiniest mass of any subatomic particle, neutrinos are produced in the sun and by radioactive decay of atomic nuclei. They zip right through the Earth at close to the speed of light, almost never interacting with—hitting—anything. These so-called “ghosts of the universe” are also its most abundant denizens, haunting its every nook and cranny. Their reluctance to interact has made neutrinos one of the most difficult particles to probe and understand. They have become the object of intense scientific scrutiny because their behavior may point to why our infant universe didn’t self-destruct the instant it was created. “Neutrino research is a journey to discover how our universe began,” says Marvin Marshak, University of Minnesota professor of physics. The six-year, $283 million, federally funded NOvA project seeks to discover whether neutrinos have potential as key actors in that early drama. First proposed by University of Minnesota physicists and colleagues from other institutions, NOvA involves 208 scientists and engineers from 38 institutions, including U professors Marshak, Kenneth Heller, Daniel Cronin-Hennessy, Gregory Pawloski, and Ronald Poling. Along with graduate students, postdocs, and others, the U is fielding the largest university contingent. NOvA begins in Batavia, Illinois, at the U.S. Department of Energy’s Fermi National Accelerator Lab, Fermilab, which generates an intense beam of neutrinos. Those neutrinos sail through the earth to a University lab, constructed in cooperation with Fermilab management, in Ash River in northern Minnesota. There, a very few are detected and studied. NOvA stands for NUMI Off-axis electron Neutrino Appearance. NUMI, in turn, refers to Neutrinos at the Main Injector, the main injector being one of the particle accelerators at Fermilab. NUMI is the name of the beam. NOvA puts the U at the forefront of the world’s current neutrino experiments, with more planned. “Minnesota has a commanding position at the center of the U.S. accelerator-based neutrino program for the next several years, a great opportunity for the U and especially our students,” says Poling, head of the School of Physics and Astronomy. If neutrinos helped save the universe, they must have done so in the first few nanoseconds of its existence. Physicists believe the universe was born in the Big Bang 13.8 billion years ago, when intense energy generated unimaginably large numbers of particles. All should have been created in pairs—twin particles of matter and antimatter, which promptly annihilated each other. As the universe rapidly expanded and cooled, particle creation ground to a halt, but annihilation went on. The universe should have destroyed itself in mere nanoseconds. Yet somehow, one billionth of the matter survived to form galaxies, stars, planets, and us. That means one billionth more matter than antimatter must have been created—a case where the symmetry of the universe was broken. This is a fly in the ointment of physics theory, because the creation process had no obvious reason to favor matter over antimatter. “Humans like symmetry, so we tend to think that the universe should have no preference. . . . The numbers of particles on both sides of [the matter/antimatter divide] should be equal and their behavior the same,” says Heller. A major question for the NOvA physicists is whether an imbalance in the behavior of neutrinos vs. their twins, the antineutrinos, could have led to this symmetry break. Fermilab generates beams of both, and NOvA will test whether these particles behave differently on their 500-mile journey to Ash River. If they do, and to a large enough extent, that data would help build new theories about their possible role in the mechanism that allowed a remnant of the universe to survive. Neutrinos are the only known particles whose behavior might harbor enough asymmetry to have had such a profound effect. During the first few nanoseconds of the universe, no atoms had yet formed. Besides neutrinos, all matter and antimatter existed as elementary particles like quarks, which later combined to form the protons and neutrons of the first atomic nuclei. “Some asymmetry has been measured, for example, in interactions of quarks, but not enough to account for the excess of matter. If the asymmetry is in known physics, it could only be in neutrinos and antineutrinos,” says Heller. The 40-year-old Standard Model theory describes nature’s fundamental forces and particles and how they interact. It lists 12 particles: six quarks, three varieties of neutrinos, and three other particles—in ascending order of mass, they are the electron, the muon, and the tau. To be detected, a neutrino must collide with an atomic nucleus in the detector and be transformed into another particle. By definition, an electron neutrino is one that turns into an electron, a muon neutrino turns into a muon, and a tau neutrino transforms into a tau. Only at the instant of detection does it acquire its identity. That’s because, due to weird quantum effects, each neutrino is actually a mix of all three varieties, which physicists call “flavors.” It’s like having three flavors of ice cream in one carton. Unlike ice cream, however, a single neutrino can shift the proportions of its flavors, becoming a different mix. For example, shifting to a mix with more of the electron flavor means the neutrino is more likely to be detected as an electron neutrino. 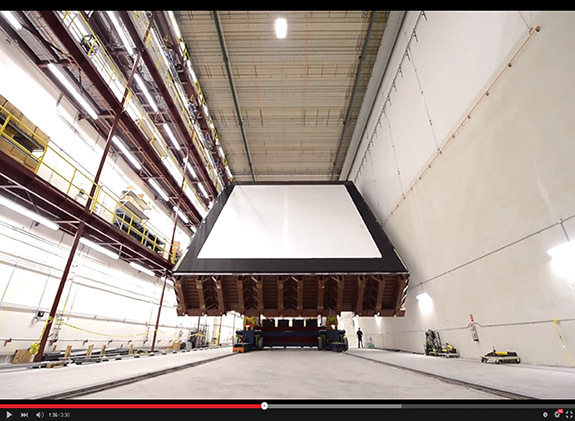 This photo is from a YouTube time-lapse video of construction of NOvA’s far detector in northern Minnesota. More than seven cameras recorded the two-year-long building process, which involved more than 700 University of Minnesota students. This shifting, called oscillation, is key to unlocking neutrinos’ role in the early universe. The Standard Model originally predicted neutrinos would be massless, which would mean they couldn’t oscillate. This was disproved by, among others, the Minnesota-based multinational experiment Main Injector Neutrino Oscillation Search (MINOS). It measured the apparent loss of muon neutrinos traveling between Fermilab and the U’s Soudan lab in Soudan, Minnesota. In fact, the “lost” neutrinos had simply oscillated into a new mix with less muon flavor. NOvA will compare the rates at which neutrinos and antineutrinos from Fermilab oscillate during the trip to Ash River. A big difference in rates would signal a break in symmetry and a possible—though not definite—role for neutrinos in the universe’s survival. Neutrinos, besides possibly helping save the universe, may tell us something about one of the most basic properties of matter: how its building blocks—the elementary particles—acquire mass. Neutrinos come in only three mixes, each with unique proportions of the flavors. The masses of two mixes are known, and NOvA aims to find the mass of the third. Called mix 3, it is richest in tau flavor. It is either the most or the least massive mix, and settling the matter is of great interest to physicists. If neutrino masses fit neatly into the Standard Model, NOvA will find that mix 3 has the highest mass. This makes sense, because tau neutrinos transform into the heaviest of the neutrino-associated particles—the tau. But if mix 3 should be the lightest, physicists would need to explain why the lightest neutrino should be paired with the heaviest particle. This strange result could happen because mass, and especially neutrino mass, is poorly understood. For one thing, particles—like the quarks and electrons that form the bulk of everyday matter—acquire their mass by interacting with the Higgs field, an energy field that pervades the universe. But tiny neutrinos must interact with it very weakly, and some scientists think other mechanisms must at least partly explain the low value of the neutrino mass. Finding answers would mean wading deeper into questions of how different forms of matter acquire mass and how mass changes during interactions of particles. These enigmas lie at the root of cosmology, the study of the universe’s origin. “We need information about every particle and phenomenon to find the right theory to explain how the universe formed and the rules that govern it—what we call a Theory of Everything,” says Pawloski. NOvA began collecting data last summer, using a detector that’s as big as neutrinos are small: 256 feet long, 59 feet wide, 59 feet tall, and tipping the scale at 14,000 metric tons. Its innards are 344,000 cells of PVC plastic filled with a scintillator fluid and wired with fiber optics. When a neutrino interacts with an atomic nucleus in the fluid, energy from the collision is converted to a light signal that tells which type of neutrino—muon or electron—is involved. To assemble, test, and ship the components of the detector to Ash River, the University of Minnesota enlisted some of the best and hardest workers around: its own students. About 700 held paid jobs in a warehouse-sized lab just a stone’s throw from campus, getting invaluable experience as well as a stake in one of the world’s premier experiments. Those students have finished their work, but the researchers have at least five more years of data collection from NOvA. “What’s exciting is being able to really probe the deepest mysteries of the universe, and there’s none deeper than how it can exist at all,” says Heller.